After now working for about two and a half years, I am finally releasing the first demo version of Monster Sanctuary! Monster Sanctuary is a Metroidvania/RPG mix up with turn based combat. Monster Sanctuary is a land where all kinds of different monsters live hidden from most of humankind. It is a place for creatures that would otherwise have no place in the world. The few humans that live in the Monster Sanctuary did so in peace since they could remember - they are called the Sanctuary Keepers. Just recently all monsters except those raised by the Sanctuary Keepers started to become hostile towards them. The protagonist of the game - a young and aspiring Sanctuary Keeper - is on a mission to solve the mystery why all of this is happening. 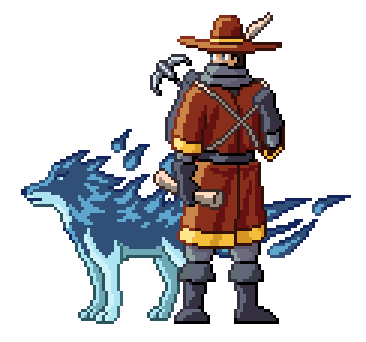 He is aided by Wolf, an ancient guardian of the Monster Sanctuary and familiar of the protagonist's bloodline. During their journey, more and more monsters join them. 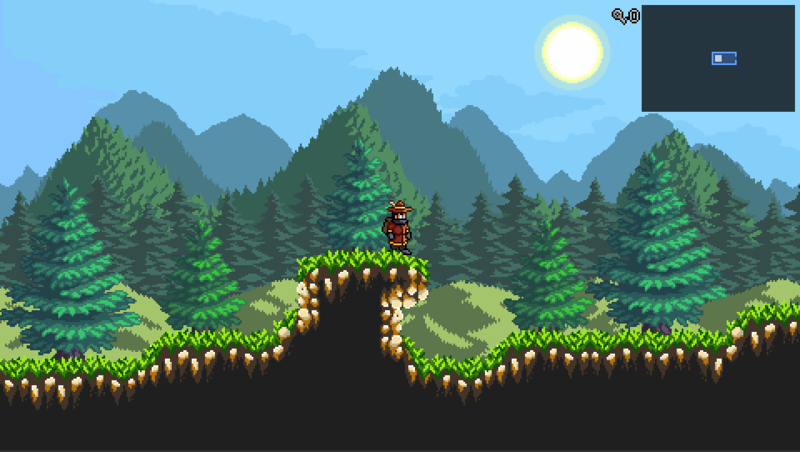 Monster Sanctuary is a typical Metroidvania-like big 2D world. You solve riddles and gather key items to unlock new map areas to progress. Living in the Monster Sanctuary in peace for centuries the inhabitants never trained any combat arts. Thus the protagonist doesn't participate in the combats himself. Instead, you give orders to up to 3 monsters.The combat is turn based similar like in many JRPGs, you choose an action for every one of your monsters in any order. Most actions consume mana but the monsters regenerate a certain amount of it every combat round. Mana management is an important part of the combat. A twist to make a turn based combat a bit more interesting is the combo system (displayed in the upper left corner in the screenshots) - every hit of an attack, every heal or buff applied increases the combo counter for the current combat round and the combo counter increases the damage dealt. The order in which the player uses his monster actions can have a big impact on the result. For example there are attacks that have a high hit count, but low damage - they are ideal to ramp up the combo counter. Also there are monsters that have low attack values but other utility skills, so they are ideal to go first in a combat round increasing the combo counter for the damage dealers. After the combat there is a result displayed to the player (Ranging from 1 to 5 stars) - based on the combat performance (most importantly the amount of turns needed) - the better the result the higher the chance to receive rare drops from the monsters. This should motivate the player to try and solve the combats as efficient as possible instead of just grinding through. Speaking of rare drops: To receive new monsters, the player needs to collect monster eggs that are exclusively rare drops you receive after combats. The player can hatch those to increase his monster party or sell them for a respectable price. Every monster has an individual skill tree with active and passive skills. There are a lot of synergies between the passive skills and different areas the monster can focus on: High damage, high hit count, critical hits, healing, buffs, debuffs, shielding and protecting. Also there are four elements for the attacks: Fire, Water, Wind and Earth and two attack types: physical and magical. Since most monsters have weaknesses to some of the elements it is good to have some versatile attack options in your monster party composition. Also you can further individualize your monsters with equipment. Like you equip a party in an RPG, you do the same in Monster Sanctuary with your monsters. I am a programmer for a middle sized developer in Germany: currently we are developing Tropico 6. In my free time I am developing Monster Sanctuary in Unity - doing the programming, pixel art, level design, music and SFX all myself. My brother is helping me with ideas, story and text/dialogues. Hey, the game look's pretty cool so far, keep it up! Also, if you ever need additional help with the soundtrack I would love to collaborate, if not then good luck with the game. This... looks... awesome!! I am very excited for this! p.s. will there be any dragons? I love dragons. ._. @Ashedragon: there will definetely be dragons! @sbeast: Thanks for the offer, i've listened throught your playlist, you do some awesome music! But currently i'm enjoying doing the music myself, althought i'm not very experienced Let's see how far i'll get with it. This looks fantastic! Mechanics look cool and I am loving the Super Metroid style environments. Worked recently on a new monster, a spectral wolf, the familiar of the protagonists bloodline and thus his main (starting) monster. I've combined pixel art with unity particle effects for it. Also duo to multiple complaints that the attacks were a bit slow i went over all of them and made them a bit faster and snappy. Also reduced some delays between animations. Also considering an option where you can select your next monsters action while the current one is still attacking. I reckon being able to choose while the animations play would be a great move! Would really help players speed up if they want to. I just watched the tutorial, interesting stuff. They should implement tilemap2dcollider very soon, i hope that will be the end of messing with raycasting for simple collision detection for that type of games. Looking good btw, reminds me of Spirit Engine a lot! After some concerns that random monster encounter might disturb metroidvania like exploring gameplay i've changed the encounter to be fixed and you can see them beforehand on the map. The combat starts when you come near to the enemies. Once defeated, you can explore the area freely. Furthermore i worked on a start combat menu that pops up before the combat starts. There you can either start the combat right away with your default monster setup or you can select your combat participants to adjust depending on the enemies you face. and, it looks like something I would absolutely LOVE to play. Looking forward! Please keep up the terrific work! I've added the 'enemy info' functionality where you can inspect the enemy stats and weaknesses/resistances. I've decided that this info is free and always available to the player, even if he never faced those enemies before. As the game emphasizes on trying to get the best possible combat results the player should be motivated to use any advantages he can get through analyzing enemy stats/weaknesses. Also i've started working on visuals for a new area, the 'Mountain Path'. It is a hill/mountain like area and actually it is currently planed that it will be the starting area of the game. This post is about the skill system in Monster Sanctuary. Every monster will have an individual skill tree where the player can decide which direction the monster will evolve into. Going for full damage, going for high combo count, going for supportive skills like healing, buffing or passives that boost your whole team. There will be many passive skills as well and you can build up synergies. Every second level you receive a skill point you can spend to learn a new skill. With current plan to cap monster level at 50, that means 25 different skills max per monster. An average skill tree will have 40-50 skills to choose from. Oh ok, I wasn't aware you were making the music as well. Well, if you decide later on you need some assistance, I'd be happy to collaborate. Amazing amount of graphics and effects. God I really love the UI in this game, so smooth. Well done! Really nice! Do you have plans for a demo? Also, you can only have 3 at a time at your party, but you can have more total, right? Can you switch them at any time?